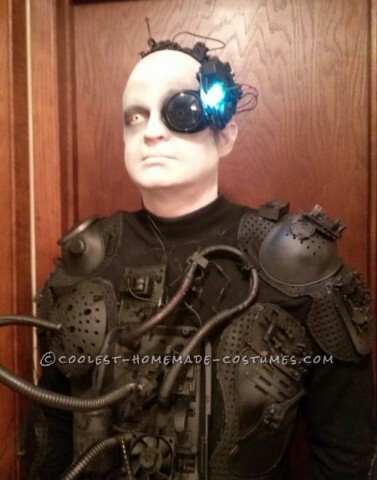 Borg Costume Made from Everyday Items « Adafruit Industries – Makers, hackers, artists, designers and engineers! Assimilating and becoming a Borg from Star Trek doesn’t need to cost a lot of money. Jodi assembled one by shopping at Goodwill and a surplus store and spent less than $50 on materials. He picked up old electronics from a Goodwill Outlet where you can purchase things by the pound, and then he broke items like phones, alarm clocks, and a coffee maker down to use the various parts. While the end result isn’t exactly a screen accurate replica of any Borgs we’ve seen, it looks close enough to one that it’s easily identifiable. Here’s how he put together the costume. I ended up hot gluing on all sorts of parts and pieces to get a good look. It was still missing something though so I headed over to a surplus store and had a look around. I found a “finger light” and pair of goggles that were perfect for the head piece along with a bunch of tubing. All for less than $10. I looked at everything and decided it was too colorful so I got some flat black and gray spray paint. Everything was spray painted black and I used just a bit of gray to highlight and break up the black. The makeup was easy, I used white everywhere except the eyes where I used black and gray. I also used a bit of gray to create some shadows on the face to make it look a bit more gaunt. We already had the contacts and they were a nice addition but it also looked great without them. All in all it was really easy to do and only took a few days to put together. It was a HUGE hit wherever we went!